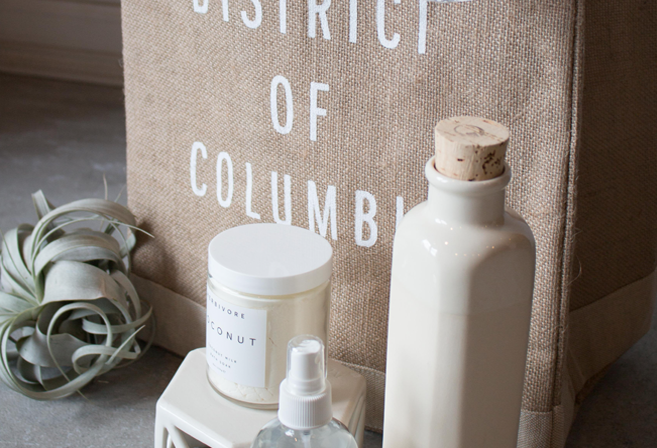 Washington, DC (May 2017) — Neighborhood Retail Group recently announced Be Clean—a natural skincare boutique offering handcrafted, small batch, plant-based apothecary items made in the USA—will open at 1338 Wisconsin Avenue NW, Washington, DC late Summer 2017. Founded by husband and wife team Trevor and Becky Waddell, Be Clean launched three years ago as an online boutique specializing in handmade, all-natural, quality skincare products and has quickly gained a national following inspiring the Waddells to officially open a flagship storefront. Neighborhood Retail Group secured the location for Be Clean, which was once home to a longstanding women’s clothing store. The charming brick front shop’s interior has since been renovated to showcase Be Clean’s ever-expanding line of facial skincare, body care, cosmetics, perfume, accessories and home products. In addition, Be Clean will offer a small selection of beauty services at the new shop including professional makeup application classes. Be Clean’s offerings may expand to include all-natural international brands in the near future as well as personal care items ranging from robes, luxury bath and body goods and even home cleaning supplies. For more information and upcoming offerings from Be Clean visit www.becleanshop.com and follow @BeCleanShop on Instagram and Facebook. About Neighborhood Retail Group A combined 80 years and four generations of retail experience in more than 180 retail properties in the DC area has made Neighborhood Retail Group (NRG) a distinguished real estate industry leader. Managing Principal and Co-Founder Bethany Kazaba brings her talent and expertise to a company focused solely on servicing the unique demands of the retail sector. From development and management to marketing and branding, the dedicated real estate professionals at NRG know what it takes to generate success for your business. For more information, visit www.neighborhoodretail.com.